In addition to exchange Market.doc, Michael and Bob also regularly exchange email messages. 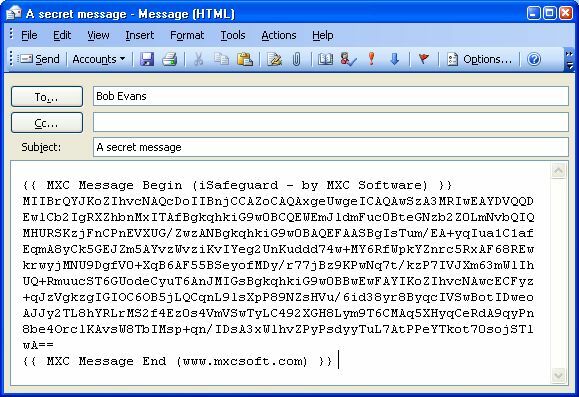 To secure their email communications, they use the hotkey feature of the software. Assume you are using Microsoft Outlook. If you use other email clients you will follow the same procedure to secure your email messages. 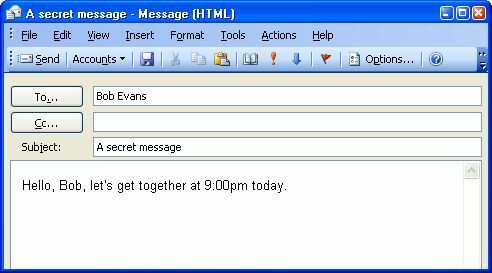 You want to send Bob a secret message asking him to meet you at 9pm today. You prepare your message as shown in the figure below. This brings up a dialog box that allows you to choose recipients from a list and a signer. If you want to read the encrypted message select yourself as a recipient as well. The message in the window is then encrypted with both Bob and Michaels's public key as shown in the following figure. Warning: If you don't select yourself as one of the recipients, you won't be able to decrypt the message even you compose this original message.